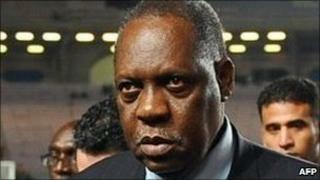 Senior football official Issa Hayatou has denied bribery claims made in a BBC documentary and has threatened to sue. Mr Hayatou, vice-president of football governing body Fifa, said money that the BBC's Panorama alleged was a bribe was in fact paid to the Confederation of African Football (Caf). He said it was part of a sponsorship deal with sports marketing firm ISL. The BBC said they stood by the claims, and that Mr Hayatou was given several chances to put his version of events. "Mr Hayatou now seems to be saying that there is an innocent explanation for the payment from ISL," the BBC said in a statement. "However, when Panorama wrote to him repeatedly and approached him in person offering him an opportunity to put his side of the story, he offered no explanation." The revelations come only days before Fifa delegates decide who will host the 2018 and 2022 World Cup finals. On Wednesday, the four 2018 candidates and five 2022 hopefuls will make their final 30-minute presentations at Fifa headquarters in Zurich. Earlier, Mr Hayatou strongly denied Panorama's allegations that he took 100,000 French francs (£12,900) in 1995 from International Sport and Leisure (ISL), which was lobbying to gain lucrative Fifa deals. "This money was not for me, it was for the 40th anniversary of Caf," said the Cameroonian, who also heads Caf. "At that time ISL was the sponsor of Caf and they give the money to Caf and not to me, and the executive committee of Caf accepted it and approved it. "I have got an appointment with my lawyers, I will talk to them and I will take it from there." In a later statement, Caf supported Mr Hayatou saying: "The context within which this information was broadcasted does not reflect the truth of what happened." The statement added that the money was a donation from ISL and that Caf's executive committee "were aware of the said donation and gave their approval". Mr Hayatou was accused by Panorama alongside two other Fifa officials - Nicolas Leoz, from Paraguay, and Ricardo Teixeira, from Brazil. All three are on the 22-strong panel currently deciding who will host the World Cup in 2018 and 2022. Earlier, the International Olympic Committee (IOC) also announced it would look into the claims because Mr Hayatou is also an IOC member. "The IOC has taken note of the allegations made by BBC Panorama and will ask the programme makers to pass on any evidence they may have to the appropriate authorities," it said. Before Mr Hayatou spoke on the issue, Fifa issued a statement saying the allegations referred to events that had taken place before the year 2000 and had been investigated by the Swiss authorities. "In its verdict of 26 June 2008, the Criminal Court of Zug had not convicted any Fifa officials," said Fifa, which is based in Switzerland. "It is therefore important to stress again the fact that no Fifa officials were accused of any criminal offence in these proceedings." Fifa granted ISL, which collapsed in 2001, exclusive rights to market World Cup tournaments to some of the world's biggest brands, and ISL received millions more from negotiating television broadcast rights. Mr Hayatou also said the bribery claims made by the BBC would not sway his decision on who should host the 2018 World Cup finals. The England bid team has criticised the decision to broadcast the Panorama edition on Monday, only three days before the votes in Zurich to decide the host of the 2018 tournament, as well as the 2022 finals. However, Mr Hayatou said: "There is a big difference between Panorama and my relationship with the England bid. There is no confusion in my mind." England face competition from Russia, Spain/Portugal and Netherlands/Belgium to win the right to hold the 2018 competition. The United States, Qatar, Japan, South Korea and Australia are bidding to stage the 2022 tournament. The Oceania Football Confederation (OFC) has meanwhile said it will not be able to vote at Thursday's meeting after its delegate, Reynald Temarii, decided to appeal against his suspension from Fifa's executive committee. Mr Temarii was suspended along with Amos Adamu of Nigeria, president of the West African Football Union, following an investigation by the Sunday Times which alleged that they were prepared to sell their votes on the 2018 finals. The acting president of the OFC, David Chung, had flown to Zurich expecting to take Mr Temarii's place on the executive committee. However, Fifa informed him that he could not do so while the appeal process was still continuing. "Despite pressures and issues at stake for the OFC, I decided not to waive this fundamental right to restore my honour, dignity and integrity following the calumnious accusations I suffered from the Sunday Times," Mr Temarii said. The hosting decision will now be made by 22 members of the executive committee following Temarii and Amadu's suspensions. Both men have denied the allegations.